YUPOBlue® is Yupo Corporation’s newest synthetic paper made specifically for and certified to run on the HP Indigo line of digital printers. Perfect for short-run and customized pieces, YUPOBlue and HP Indigo give you the flexibility of using an incredible substrate on those printing projects that must meet the tightest of deadlines. YUPO Octopus Blue is available in a digital grade as well. Q: What type of projects work best with YUPOBlue and the Indigo Printer? 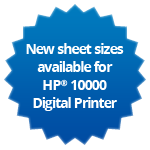 A: YUPOBlue is a uniquely different synthetic paper because it gives you the opportunity to customize your print message with HP Indigo’s variable printing capabilities. * This is increasingly important in one-to-one marketing. Its faster drying time gives you an edge when deadlines are tight and its waterproof attributes are perfect for menus, outdoor materials, direct mail, brochures and so much more. Q: What weights of YUPOBlue Synthetic are available? A: We offer YUPOBlue in five weights of 12” x 18” sheets – a 78lb 5.9 mil text, a 58lb 8.0 mil cover, a 74lb 9.9 mil cover, a 86lb 11.6 mil cover and a 100lb 13.8 mil cover. Q: Why would I use YUPOBlue on the Indigo printer as opposed to a traditional offset printer? A: In addition to all of YUPO’s renowned attributes – its brightness, waterproof uses and tear-resistance, YUPOBlue makes it possible to do short runs and customized pieces quickly and easily. Q: Does YUPOBlue take as much time as regular YUPO to dry? A: No. The HP Indigo inks dry immediately. Q: Do I need to put a top coating (like a UV coating) over my printed piece? A: Depending on your application, a top coating may be necessary to protect the printing. Applications like menus and manuals or other demanding applications may benefit from a top coating. However, it is best to test the material in the end-use application to determine what is necessary. Contact Yupo Corporation America today to request a Sample Pack. *YUPOBlue is not compatible for use with inkjet or laser printers.